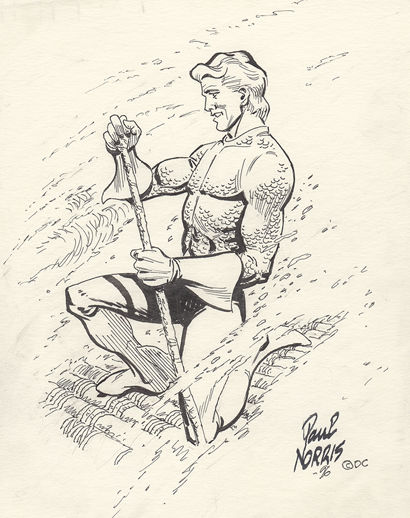 This gets a big WOW from the Shrine, an Aquaman sketch by the Sea King's original artist/co-creator, Paul Norris! Norris didn't last on the Aquaman strip long, but as comic fandom came into its own in the 70s and 80s he earned some well-deserved fame for his part in Aqua-History. He was asked to draw the character for the big DC Comics office wall mural, and would do Aquaman commissions for fans. This is from the vast Aquaman art collection of F.O.A.M.er Kevin Elman, who was kind enough to share it with us. Thanks Kevin! Wow, that is just a lovely piece.